Take Frwy 15 North to Frwy 215 North to Hwy 74 East Take Hwy 74 (Florida Avenue) to the right (East) and drive all the way through Hemet toward the mountain. Head up the mountain to Mountain Center. Turn left at the fork in the road to the stop sign at Hwy 243. 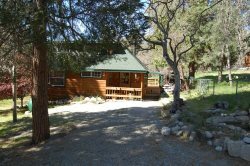 Turn left onto Hwy 243 and continue up the mountain on Hwy 243 to Idyllwild (approx. 4 miles). Turn Right on N. Circle Drive. Take Hwy 243 North (left) to Idyllwild At the fork in the road, bear to the left onto North Circle Drive. Continue on Hwy 243 to North Circle Drive.